Mikogo is a free desktop screen-sharing and remote access tool that lets have online web conferencing, troubleshoot problems with remote access to other machines, Product Demos, Online Presentations, and Webinars.Just register for a free account at Mikogo and Download a software and ready to share your desktop with anyone without an account can see your desktop, with just an invite code. Transfer Files – Transfer files of up to 200MB during your conference. All information transmitted during online meeting is encrypted via 256-Bit AES end-to-end encryption. Unique Meeting ID and Meeting Password. 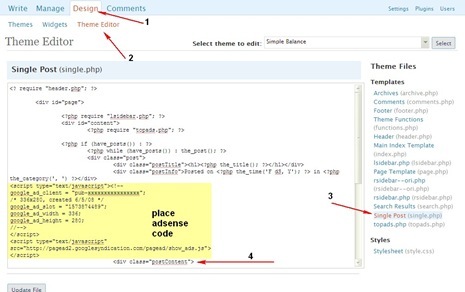 You can start and join meeting easily using Firefox Mikogo Addon and Mikogo Skype Extra. 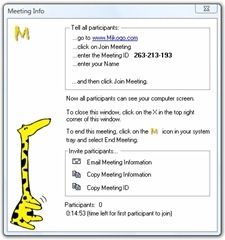 After installing Desktop Client Mikogo,a tray icon “M” is visible,next Right Click on it and click “Start Meeting” which will generate a Meeting ID and for other to join the meeting share this Meeting ID with other. Next users can visit “Mikogo HomePage” and click “Join Meeting” on the top right corner and download the “Mikogo Meeting Player” Run the software and enter the “Meeting ID” your friend shared and your “Name”. 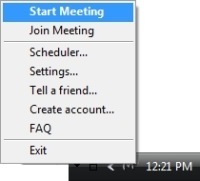 To end a meeting right click on the tray icon. How Does Mikogo Work ? The meeting organizer and participants are currently in contact via phone. The organizer starts a meeting from their desktop, receives a unique 9-digit meeting ID from the Mikogo server, and distributes the meeting ID to their participants. Participants open their Internet browser, go to www.mikogo.com, click on “Join Meeting”. There are no installations or registrations required for the participants. They simply run the software and enter the meeting ID. 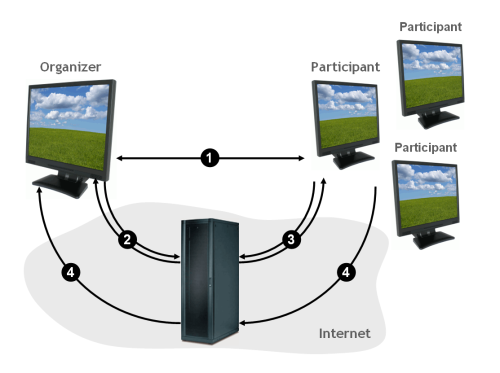 A connection is instantly established, and the participants can view the organizer’s screen in real time via the Mikogo viewer window. 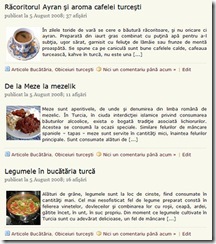 The tool is free for both personal and commercial use and works on Windows 2000/XP/2003/Vista/7 and Mac. We have a purely browser-based solution for screen sharing, AlmostMeet, that you may want to give a try. None of the participants need to install anything even if they all want to share their desktops; just click a link to bring up the shared session. We also have high-quality P2P voice and video chat, a revolutionary whiteboard, file sharing, and more. Our focus is more on group collaboration though, rather than software demos and presentations. Hi, have you ever heard about TeamViewer? TeamViewer is a remote control and desktop sharing solution of the TeamViewer GmbH in Germany (http://www.teamviewer.com). TeamViewer establishes connecions to any PC or server all around the world within just a few seconds. You can remote control a partners desktop to give online assistance, or you can show your screen to a customer – all without worrying about firewalls, IP addresses and NAT. TeamViewer also as a lot of other features. All this is free for personal use. Find out why more than 15.000.000 users trust TeamViewer! .-= Karin´s last blog ..TeamViewer 4.1.6320 =-.